If someone asks what photo album is my best, my answer will be ”My next album”. I completed my 2017 with a wedding album for Joycelyn and Leighton, a young and modern couple. For me, this is my best album of 2017 because I applied almost everything I learned in the year with all the passion for outdoor weddings. What a photographer is interested in might be the impressive photos engaging with branding. But for wedding photography, the most interested thing is to capture the true and spririted feelings in every breath. Huy and Thanh are extremely special. They really care about the small and simple things which relate to friendship and familyhood. Wedding in their eyes is an occasion to look back all the memories they had with all sadness and happiness that they’ve gone through, and also marks their beginning of a new chapter in life. It is a completely fresh feeling, a little bit of risk and not to mention the eagerness when you are having chances to experience new interesting things. No words can describe the strong emotion that I have hearing the couple says “It was totally beyond our expectation”. 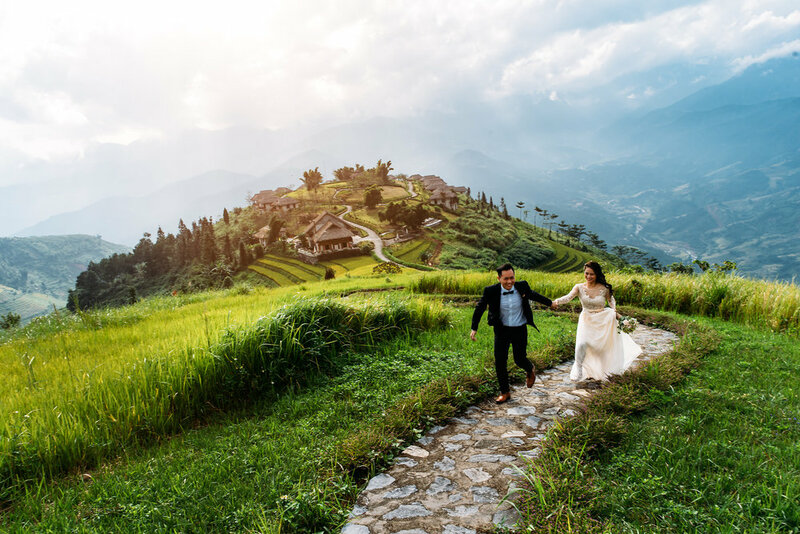 The couple was very satisfied with what they have experienced and again decided to let Khoi Le take care of their big day. Thank you for always having your full faith in Khoi Le Studios.